Speed up analytics by migrating your data into the HDFS. The steps in this tutorial are written for someone with a basic knowledge of executing SQL queries and an elementary knowledge of HDFS commands. The database system used is PostgreSQL 9.5 for Windows, and the HDFS version is Cloudera Hadoop 2.5.0-cdh5.2.0 on a Centos 6.4 Linux virtual machine. Apache Sqoop relies on the JDBC driver JAR files that are specific to the relational database vendor and database version. To execute the steps shown in this article, the user will need permissions to connect remotely to the PostgreSQL database, SELECT permissions on the relational database, write permissions on the HDFS, and execute permissions on the Sqoop executable. 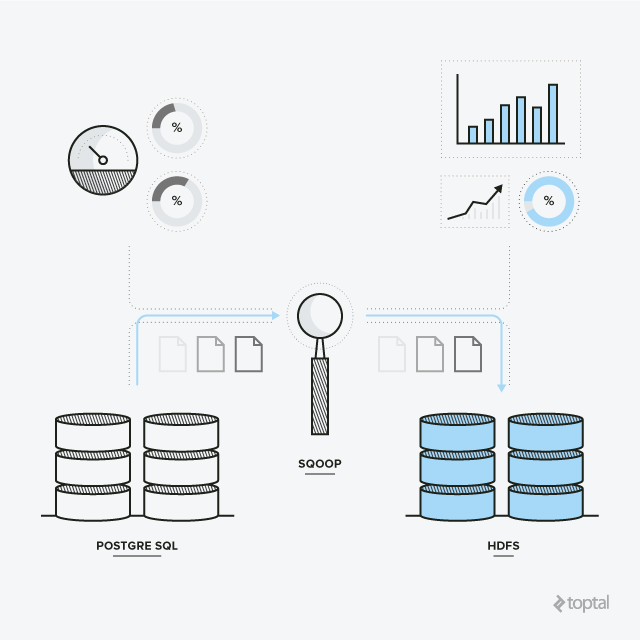 For the purpose of this tutorial, we created a PostgreSQL database, named it Toptal, and made it accessible through port 5432. To get started, in our PostgreSQL Toptal database, we will create a test data table named sales. We will assume that the OpenSSL certificate and private key files already exist on the PostgreSQL server. The data looks good, so let’s proceed. With the data source defined, we are now ready to import the data into the HDFS. The sqoop command we will examine is listed below, and we will break down each argument in the bullet points that follow. Note that the command is supposed to be on one complete line or, as shown below, with the backslash (the Linux command line continuation character) at the end of each line except the last. sqoop import - The executable is named sqoop, and we are instructing it to import the data from a table or view from a database to the HDFS. --connect - With the --connect argument, we are passing in the JDBC connect string for PostgreSQL. In this case, we use the IP address, port number, and database name. We also need to specify that SSL is being utilized and need to supply the SSLSocketFactory class to be used. --username - In this example, the username is a PostgreSQL login, not a Windows login. The user must have permissions to connect to the specified database and to select from the specified table. -P - This will prompt the command line user for the password. If Sqoop is rarely executed, this might be a good option. There are multiple other ways to pass the password to the command automatically, but we are trying to keep it simple for this article. --table - This is where we pass in the name of the PostgreSQL table. --target-dir - This argument specifies the HDFS directory where the data is to be stored. --split-by - We must provide Sqoop with a unique identifier to help it distribute the workload. Later in the job output, we will see where Sqoop selects the minimum and maximum values to help set split boundaries. Now, it is time to execute the above Sqoop command script. The output from the Sqoop command is shown below. Note: /tmp/sqoop-training/compile/77f9452788024792770d52da72ae871f/sales.java uses or overrides a deprecated API. 16/10/02 18:58:43 WARN manager.PostgresqlManager: It looks like you are importing from postgresql. 16/10/02 18:58:43 WARN manager.PostgresqlManager: option to exercise a postgresql-specific fast path. 16/10/02 18:58:45 WARN mapred.JobClient: Use GenericOptionsParser for parsing the arguments. Applications should implement Tool for the same. 16/10/02 18:58:46 INFO db.DataDrivenDBInputFormat: BoundingValsQuery: SELECT MIN("pksales"), MAX("pksales") FROM "sales"
16/10/02 18:59:18 INFO mapreduce.ImportJobBase: Retrieved 20 records. Notice the last line of output above shows that 20 records were retrieved, which corresponds to the 20 records in the table on the PostgreSQL database. After executing the Sqoop command, we can execute the hdfs dfs -ls command to see the directory that was created by default with the table name on the HDFS. We can use the hdfs dfs -ls command again to list the contents of the sales directory. If you look on the HDFS, you can notice the data is partitioned and spread across four files by default, not just contained in one. The hdfs dfs -cat command will display all of the records in the first partition of the sales data on the HDFS. Notice that the default file delimiter is a comma. Also, notice that there are only five rows in each partition, because the 20 rows in the source have been equally distributed across the four partitions. To limit the number of rows that are output to the screen, we can pipe the output of the cat command to the head command as shown below, to check the contents of the other three partitions. The -n 5 argument to the head command limits the screen output to the first five rows. --query "select s.pksales, s.saledate, s.saleamount, o.shippingtype, o.methodofpayment from sales s inner join orders o on s.orderid=o.orderid where o.methodofpayment='credit card' and \$CONDITIONS"
In the above command, we use some of the same arguments to the Sqoop command, but they take on differing importance when used with a SQL command. --split-by - Even though we are selecting the primary key of the sales table, we still have to provide Sqoop with a unique identifier to help it distribute the workload. --query - This is the argument in which we supply the SQL query. The query above is enclosed in double quotes. Notice that there is not a backslash (the line continuation character) in the multiple lines containing the query. Also notice the and \$CONDITIONS at the end of the WHERE clause. This is required by Sqoop because Sqoop will automatically replace the $CONDITIONS token with a unique expression. HDFS has many advantages over the relational databases. If you are doing data analysis, you should consider migrating your data to HDFS, today. With the skills learned here, importing data from a relational database system into HDFS is a simple and straightforward process that can be accomplished with a single command. While these examples have a small number of rows, the mechanics of importing large volumes of data to HDFS from a PostgreSQL database table remains the same. You can even experiment with importing large tables and varying storage delimiters. Using Apache Sqoop is more efficient than exporting the database data to a file, transferring the file from the database server to the HDFS, and then loading the file to the HDFS. Dallas has 22 years of database application development experience. He has worked with SQL servers and Oracle and he is comfortable with both Windows and Linux. He also has experience with data analytics on OLAP platforms and data mining. Furthermore, Dallas has extensive experience with ETL tools such as SSIS and IBM's DataStage. He also writes articles for the MSSQLTips.com website.